Detects PMCA 2a and 2b ATPase. Synthetic peptide corresponding to Human Calcium Pump PMCA2 ATPase aa 5-19. WB: Human and rat brain tissue lysates. IHC-P: Human brain and cervical carcinoma tissues. 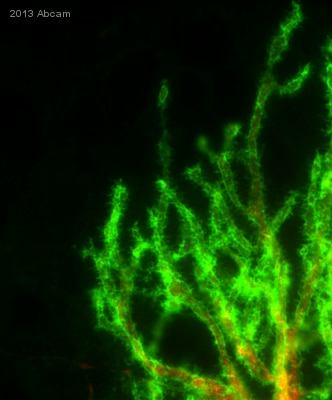 Mouse purkinje cells. Our Abpromise guarantee covers the use of ab3529 in the following tested applications. WB Use a concentration of 1 µg/ml. Detects a band of approximately 137 kDa (predicted molecular weight: 137 kDa). Mainly expressed in brain cortex. Found in low levels in skeletal muscle, heart muscle, stomach, liver, kidney and lung. Isoforms containing segment B are found in brain cortex and at low levels in other tissues. Isoforms containing segments X and W are found at low levels in all tissues. Isoforms containing segment A and segment Z are found at low levels in skeletal muscle and heart muscle. Belongs to the cation transport ATPase (P-type) (TC 3.A.3) family. Type IIB subfamily. There are 8 isoforms of Calcium Pump PMCA2 ATPase (Swissprot). Ab3529 is expected to recognise all isoforms. The predicted molecular weight of the different isoforms ranges from 127-kDa to 138-kDa. The detection of more than one isoform by ab3529 in brain tissue lysates may explain the banding pattern observed. Abcam welcomes customer feedback and would appreciate any comments regarding this product and the data presented above. ab3529 staining Calcium Pump PMCA2 ATPase in Mouse purkinje cells in cerebellum tissue sections by Immunohistochemistry (IHC-P - paraformaldehyde-fixed, paraffin-embedded sections). Tissue was fixed with paraformaldehyde and permeabilized with 0.5% Triton X-100. Samples were incubated with primary antibody (1/500 in PBS + 3% NGS + 0.5% Triton X-100) for 16 hours at 4°C. An Alexa Fluor® 488-conjugated Goat anti-rabbit IgG monoclonal (1/500) was used as the secondary antibody. Immunohistochemistry was performed on normal biopsies of deparaffinized Human brain tissue. To expose target proteins heat induced antigen retrieval was performed using 10mM sodium citrate (pH6.0) buffer microwaved for 8-15 minutes. Following antigen retrieval tissues were blocked in 3% BSA-PBS for 30 minutes at room temperature. Tissues were then probed at a dilution of 1:200 with a rabbit polyclonal antibody recognizing PMCA2 ATPase ab3529 or without primary antibody (negative control) overnight at 4°C in a humidified chamber. Tissues were washed extensively with PBST and endogenous peroxidase activity was quenched with a peroxidase suppressor. Detection was performed using a biotin-conjugated secondary antibody and SA-HRP followed by colorimetric detection using DAB. Tissues were counterstained with hematoxylin and prepped for mounting. Immunohistochemistry was performed on cancer biopsies of deparaffinized Human cervical carcinoma tissue. To expose target proteins heat induced antigen retrieval was performed using 10mM sodium citrate (pH6.0) buffer microwaved for 8-15 minutes. Following antigen retrieval tissues were blocked in 3% BSA-PBS for 30 minutes at room temperature. Tissues were then probed at a dilution of 1:20 with a rabbit polyclonal antibody recognizing PMCA2 ATPase ab3529 or without primary antibody (negative control) overnight at 4°C in a humidified chamber. Tissues were washed extensively with PBST and endogenous peroxidase activity was quenched with a peroxidase suppressor. Detection was performed using a biotin-conjugated secondary antibody and SA-HRP followed by colorimetric detection using DAB. Tissues were counterstained with hematoxylin and prepped for mounting. Publishing research using ab3529? Please let us know so that we can cite the reference in this datasheet.